Checked by the civilian firm Südd [deutschlands] Abwassernninigungs GmbH (South German Waste Water Purification Co Ltd) of Ulm on 10/12/42. The positions of the photographer for photos 10 and 12a are indicated on the drawing [34 and 36a]. 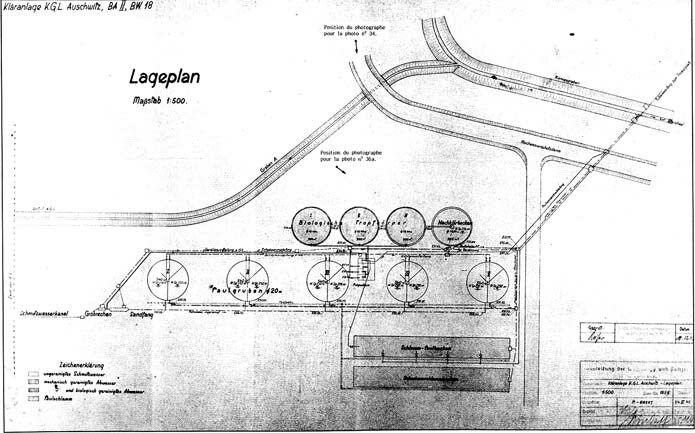 Drawing 1855 is not the final plan for Kläranlage II, but does show the actual locations of the main components of the station. The final decantation basin was to be transferred to the south of the station and replaced by a fourth biological purification basin. These 4 basins were never completed and remained as they are to he seen today (photographs in the Bauleitung Album: PMO neg. nos 20995/449 [Photo 12a], /450 and /452). The primary screening was modified and strengthened. The floating sludge basin was never dug. The purification station was coupled with 4 a “provisional” earth decantation or sedimentation basins to the west of the station (where the Ulm company's stamp is on the drawing). Only the decomposition beds were ever brought into operation.